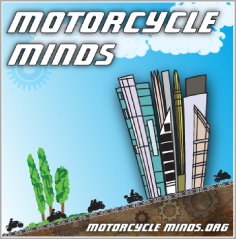 ACEM (Association des Constructeurs Européens de Motocycles), the Motorcycle Industry in Europe has just released its latest newsletter (July 2011) which not surprisingly, looks at the issues that affect the motorcycle industry, but also those that affect European motorcyclists. It includes comments about the French government’s proposals which led to mass demonstrations across France in June. In his editorial, the ACEM Secretary General, Jacques Compagne leads on the Type-Approval Regulation for L-category vehicles – the frame work regulations for motorcycles – commenting “….this regulation represents the future for the motorcycle industry”. At Right To Ride we would add that this (the regulation) represents the future for motorcycling. Any other topic at present is only a side issue. Jacque Compagne relates this to June 20th, as this was the deadline for the presentation of the amendments in the European Parliament. Looking at the IMCO time line, tomorrow 12th July sees the Internal Market and Consumer Protection (IMCO) committee considering these amendments during a 15 minute session, with a vote on the amendments at an IMCO meeting scheduled for the 5th – 6th October 2011. According to the IMCO document, there are in total 298 amendments tabled on the proposed regulation with not only mopeds and motorcycles but also quadricycles (such as on-road quads and mini-cars). Draft report – 22nd June 2011 – Approval and market surveillance of two-or three-wheel vehicles and quadricycles. As mentioned the ACEM newsletter contains the industry’s views on the proposals in France to adopt new Road Safety measures for PTWs introduced by the CISR (Comité interministériel de la sécurité routière). One of the major issues that has been highlighted by French riders, their riders organisation FFMC – the Fédération Française des Motards en Colère (The French Federation of Angry Bikers), rider organisation in UK – MAG UK, their demos and individual riders on websites, blogs and social media sites such as Facebook relate to fluorescent equipment for riders. Although ACEM say that, “Conspicuity is an important issue when it comes to the safety of motorcycle riders. ACEM encourages users to buy clothing that incorporates fluorescent and/or reflective materials” they highlight that, “that there is no scientific proof of the benefits in terms of safety of wearing reflective clothing” with ACEM in favour of a voluntary approach to design and market fluorescent and/or reflective motorcycling apparel. Meanwhile at Right To Ride we have picked up that Michèle Merli, now the previous head of France’s road safety, allegedly said in a national radio interview “It would appear that the bikers have totally misunderstood the proposal for all to wear a fluorescent high visibility yellow vest! Ms Merli has said, it has never been a question of wearing that vest but rather propose (not impose?!) to bikers that they wear a little yellow strap around their arm so that they can be better seen by motorists (…)”. 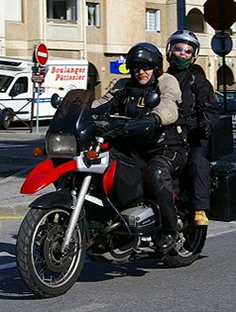 However in a communication by the CISR, in the section “Improving the visibility of motorcyclists” it states (using Google Translate), that the CISR has decided to mandate the wearing of retro-reflective equipment: high visibility vest or jacket with retro-reflective strips for all users motorcycles and tricycles and more than 125 cm3. Further stating that failure to comply with these obligations will be sanctioned for violating a third class and the loss of two points. It seems that from a proposal of non-imposition to mandatory wearing of a high visibility vest or just a jacket with retro-reflective strips, to mass demos and anger by riders, perhaps there is something that got lost in translation or was it perhaps a U-turn in response to the demos held in France? While we support the French riders, there has been mention on the afore mentioned websites, blogs and social media sites that this French legislation could spread across Europe. We have asked the UK’s Prime Minister’s office and the Minister for the Department for Transport. Are there any plans to introduce in the UK to mandate the wearing of HiViz/Day Glo jackets/vests for motorcyclists? Are you aware that the European Commission is planning to introduce legislation so that member states will have to introduce the compulsory wearing of HiViz/Day Glo jackets/vests? We also contacted the RSA (Road Safety Authority in Ireland) – in 2009 the RSA proposed to introduce regulations for the mandatory wearing of sleeved high visibility upper body clothing for rider and pillion passenger. As this is only a “Euro border” away, there appears to be some consternation amongst riders that this proposal is already law in Ireland, which is not the case. We asked whether the proposals in the 2009 consultation will be introduced in Ireland at some point in the future as legislation. ACEM also has major concerns regarding the mandatory training proposals by the CISR in France in the case of “5 years of abstinence” (from riding a motorcycle) and suggests that this will be difficult to enforce and will have the only consequence of annoying the users. You might regard this as “sitting on the fence” but is there a EU directive that includes efforts to harmonize the size of motorcycle numbers? Meanwhile ACEM report that the German Government has approved a proposal from their Transport Minister to reduce the size of registration plates. Apparently since last April the size of German motorcycle plates has been reduced to a minimum size of 18 x 20 cm. The new regulation also applies to temporary plates and vintage motorcycle plates. Smaller motorcycles plates already exist in neighbouring countries such as Austria or Italy. At Right To Ride our comment to this is “Fantastic, maybe Mr Ramsauer could have a chat to his French counterpart”! Moving on to more European Directives, ACEM report that in Spain, ANESDOR, representative of the motorcycle industry in Spain, have denounced the Spanish Government’s initiative to illegally anticipate the application date of the 3rd Driving Licence Directive. This directive was voted on and passed in the European Parliament in 2006, should have been transposed into national law by January 2011 and then enter into force as of 19th January 2013. The directive is designed to harmonize motorcycle licences across Europe, although the directive allows members states flexibility at what age they can allow a rider to access the licence categories. “ACEM always welcomes measures aimed at improving road safety but it cannot be asked to support ill thought out initiatives that go in the direction of discouraging users to take to PTWs. The application of the 3rd Driving Licence Directive can improve the access of users to PTWs, but adding more illogical provisions to the ones foreseen in the Directive only indicates an effort to oust PTW use instead of seeing it as a real opportunity to make traffic more fluid and reduce travel times and pollution. ACEM expects the European Commission to take its responsibility and address these issues with the Member States”. To complete our reporting of the ACEM Newsletter, ACEM comments that the Joint Transport Research Centre of the International Transport Forum and the OECD has launched a Working Group on “Motorcycling Safety and Mobility”. The aims of this working group are to build on the Conclusions of the 2008 ITF/OECD Lillehammer Workshop. This was first international event gathering all stakeholders involved in the safety of powered two-wheelers. Well this working group in consultation with stakeholders (including motorcyclists’ associations, PTW manufacturers, police, etc.) could be very influential. ACEM reports that the Working Group will address topics such as the evolution of the fleet of powered two-wheelers and of their riders, accident scenarios and contributing factors, levies for action, implementing an integrated road safety strategy for PTW riders, situation in low- and middle-income countries. By the end of 2012, the Working Group is expected to prepare a report for the attention of policymakers and their advisors, with policy recommendations on measures to improve the safety of riders of powered two-wheeler vehicles. The conclusions of the report will outline recommendations mainly intended for national policy makers and their advisors.